If you are into it, and I know you are, we should be picking an undead presidential candidate this year. He already has my vote. 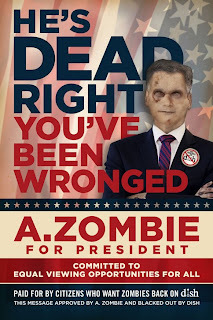 A. Zombie believes in freedom of eating, and the right to eat arms everywhere. His campaign platform is to have Dish Network start carrying AMC again. He just launched his tour in San Diego, and is slated to make stops all over these great United States. His next stops are: Dallas, Atlanta and New York. I am sure there will be a few pit stops along the way. He has to eat right? Keep your eyes open, He will be around Charlotte and Tampa as well. Lock your doors.